There are many brands to choose from at the grocery store, though Tostitos seems to have ensured itself the most prominent spot, lined up on its own special shelf all the way down the chip aisle, right at eye level. We decided to stick to the big ones this time: Pace, Ortega, Tostitos, Old El Paso, and Newman's Own, with obnoxious talk show host Don Imus's thrown in for fun. (All of them are available at Shaw's and Stop & Shop.) The winner was one we had never tried before: Old El Paso picante. 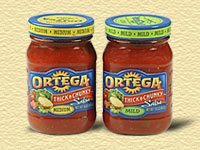 (Old El Paso also makes a ''Thick 'n Chunky Salsa," which is not as good as its picante. What's the difference between picante and salsa? Nobody seems to know for sure. Our resident Texan says there's none.) The Old El Paso was far from adored but notable for being, as one taster noted, the ''least hated" of the samples.